ATTENTION: If you have an identical camera then check out this product safety recall notice. Here, in the UK, the repair didn't take long and it was back with me in less than a week. Most of the pictures on this site were taken with my Kodak DC5000 digital camera. I bought it in March 2001 primarily to use with my work but, as you can see, it gets plenty of personal use too. My work involves occasional visits to construction sites which are often very muddy. I chose this camera because it is completely waterproof - there is plenty of rubber on the outside and all the doors and controls have 'O' ring seals. I use rechargable Ni-Mh AA cells rated at 1800mAh. Each set of four cells normally lasts for 80 to 100 shots. I have a fast charger which usually restores them in a couple of hours. In Nepal I carried a small solar charger on the top of my pack. Whilst this was effective in the thin, clear air I think it would be too slow too use back home. In high resolution mode the images are 1760 x 1168 or just over 2 megapixels. Using minimum compression mode each image normally takes about 400k to 800k of space. Some complex images are over a megabyte. Most of the large images on this site have been resampled to 1/4 of this area and most of the thumbnails are 1/16 of that. The original 8 megabyte card fills very quickly so I have added two 128 megabyte cards, each carrying around 210 high-res pictures. If you have a digital camera then you might like to check out whether it supports the EXIF picture format. 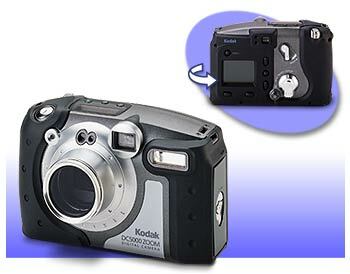 This stores information such as shutter speed and aperture together with the JPEG image. Details are available here on the Kodak website and a viewer is available from Tabaware. I like this camera a lot and hardly ever get my SLR out these days. For me its plus points are: uses standard batteries; uses compact flash storage which is cheap and flexible; solid, waterproof, construction; and it takes good pictures! Some weak points are: the LCD screen is useless outdoors - why they used a transmissive device instead of reflective one I don't know; the download software is very poor, it only supports drag and drop not cut and paste, you cannot write pictures back to the camera; some shots are out of focus, particularly in poor light and, unfortunately, there is no manual focus control. I started creating these web pages using Microsoft Frontpage - because it was there. I soon got fed up with that and, after trying a couple of other packages started writing raw HTML using a simple text editor. It's quite easy once you have the hang of it. The layout and style is all my own. Apart from the camera pictures, the only things that I have 'borrowed' from elsewhere are the compass and the background.